OK, here’s a new one. Fresh out of the postie’s satchel, sent to me by my friend in Japan. I believe it’s a relatively new release on the Japanese market. It is the Uni “Kuru Toga” (M5-450 1P) mechanical pencil by Mitsubishi Pencil. What does Kuru Toga mean? Well, apparently ‘Kuru’ is a sort of Japanese sound symbolism that we don't really have in English, but anyway it's associated with ‘turning’, and ‘Toga’ is the shortened form of ‘togaru’ which means ‘be sharpened’. The pencil itself has 'Kuru Toga Engine' printed on it. Quite simply, the idea is that as you write the lead is auto-rotated around so that it maintains a sharp point and doesn’t get a chisel edge on it, leading to changing line thicknesses as you write or if you rotate the pencil in your hand. 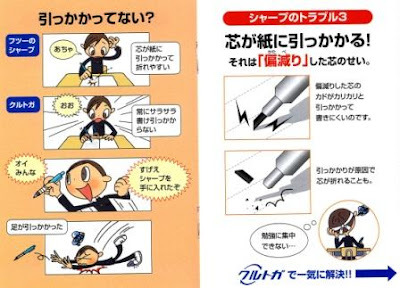 The pencil comes with a 12 page little cartoon style A6 size booklet explaining the virtues of Kuru Toga. Now I don’t read Japanese, so no idea what it actually says, but here it is reproduced in full, so I think we can all get the general idea. I scanned it lay flat, so six scans of A5 size. I haven’t pulled the mechanism apart but clearly the concept is that the lead-holding jaws are mounted on a toothed clutch. Each time you press down to write the clutch teeth engage and the sliding faces cause the lead to be rotated around a fraction. The trick then is the constant lifting and pressing back down as you write. The clutch is springing apart and back together, rotating each time. Now this is a 0.5mm pencil, so a chisel edge on the lead isn’t a huge deal, but still, it’s a heck of an idea. There is also a 0.3mm version. Now that would be a sharp point! Still, Uni extol the virtues of the constantly sharp point for neat precise writing, and a reduction in lead breakage. Right then. Does it actually work? Well… yes, it does. Whether you really care, well…that’s another matter. So, first thing I did was get an ordinary pencil (Lamy 2000) and the Kuru Toga and make sure they had good clean leads with a square end. Start writing. Clearly normal started out a thin line and got progressively thicker as the end wore down to a chisel point. I did not rotate the pencil in my hand. 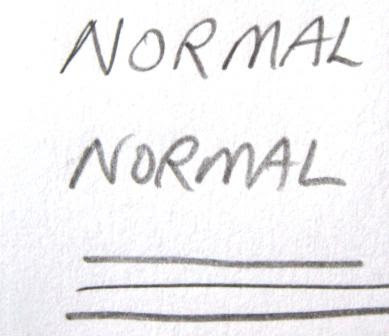 The picture below shows ‘normal’ at the start and then ‘normal’ after a line of writing. At the bottom of the picture are three lines – the middle one is at the start, the one above and below are after the chisel edge has been worn on the lead. So, we can see what happens normally, things get thicker as the lead wears. (Phew, it's like rocket-science) Now Kuru Toga. 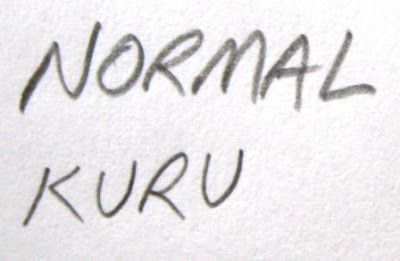 Below is a picture of ‘normal’ and ‘kuru’ after a couple of lines writing with each. Normal has worn to a chisel point and makes thicker lines. Kuru stays sharp. To recap – here’s the 3 line test for both, shown together. For each, the middle line is the start with a fresh new lead, the lines above and below are drawn after a couple of lines of writing with that lead. One thing I did note with Kuru Toga was that it always felt slightly scratchy on the paper. You know how when you pick up a pencil and by chance you start writing with the sharp side or tip of the chisel point and it digs or catches a little on the paper. Well, that’s basically what kuru is doing, always presenting the sharp edge to the paper, so it’s not the smoothest of writing experiences. Still, nothing to get too hung up over. That's marvellous – almost unbelievable. You wrote: "These sorts of ideas and innovations are occurring in Japan, not elsewhere." 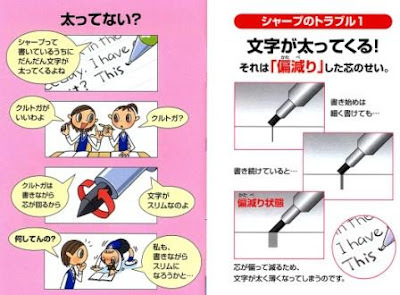 I wonder which cultural and economic aspects of Japan account for such a variety of high-quality and smart writing implements with features like that in the "Kuru Toga". 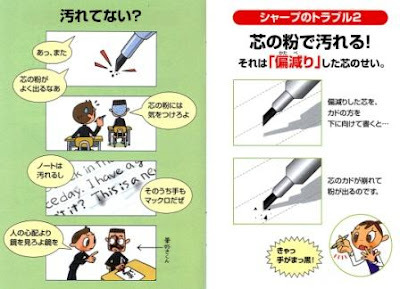 (I have read the paper "Japan and the Mechanical Pencil" but it doesn't answer the question on the cultural aspects.) Of course there are the Japanese signs that require fine tips and the calligraphy tradition but I am convinced that there is more than this. The Karakuri tradition as well as the history of craftwork may be also responsible for the huge interest in technological marvels. As useful as many of the numerous unique features may seen, quite a few of them are not really necessary so I assume that this extravagance and its creators are rewarded not only monetary – but by what standards? Dave, what an absolutely delightful post! I pray to the Pencil God that JetPens will make this marvel available here in the U.S. I don't know if I can answer Gunther's question, but perhaps in Japan excellence is its own reward? The product literature itself is so cool--it kind of tells a story. This thing is an instant collectible. What fun! "excellence is its own reward" sounds very plausible. – If someone is interested: Google's translation of the uni/Mitsubishi press release for the Kuru Toga (although some parts of the translation are of limited use). You know to be honest I was a little blasé about the Kuru Toga to start with, but I’m now starting to think that this is a major innovation. Conceptually this is the self-sharpening pencil. That’s a great leap forward, like the development of ratchet lead advance mechanisms, modern thin-leads, auto-feed mechanisms, etc. Sure not all of them may work all that well, but it’s the concept – the self-sharpening pencil! 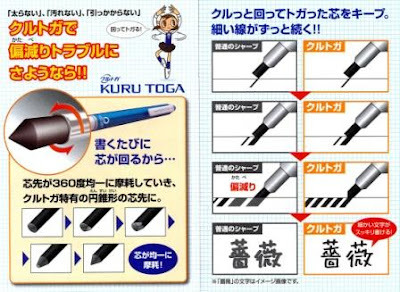 Now, stick this “Kuru Toga Engine” on a 2mm leadholder…where does that take us? That actually looks like a great idea. Because I spend most of my time using a fountain pen, I tend to hold pens and pencils at quite a shallow angle now. That makes the 'chisel tip' problem worse. A 0.7mm pencil ends up a bit too thick to write reasonably small with, while 0.5 is just usable, but a bit thicker than I'd like. With 0.3mm, I end up with the chiseling effect making a really sharp tip that ends up digging into the paper when I vary the angle a bit. Hmmm. I wonder what the chances are of persuading Uni-ball UK to bring these over here? I'm thinking probably zero. Very neat pencil David. Do they make one in stainless steel? As you know, I'm not a big fan of the plastic pencil. Very nice. I'll pick one up when jetpens/jpens offers. Do they even teach kids today to twist the pencil to keep the point when drafting with instruments? I guess all those skills are pretty much a lost art these days. This is great! As a middle school student, no one ever seems to understand why I always rotate my pencil around. This would be the perfect solution- if only they sold it in the U.S.! Good or not isn't matter, I'm just impress with the idea. "So, it’s British yet made in Austria? I wonder if they mean the graphite came from Britain?" In the 18th and 19th centuries, graphite from Britain was of superior quality. As far as I know it was even forbidden to export graphite. Later, new deposits were found in Siberia that were of higher quality and allowed longer pencils to be fabricated. Anyway, "British graphite" was a mark of quality (or meant to be one), when Koh-i-Noor made those pencils in the 1920s. Kinda like "Swiss chocolate". I mean is it harder to shake a pencil or click it? Japanese are light years ahead in innovation from other countries, and not only in pencils. They tweak things around until something new emerges. I have to buy this one. Here's a link to the Kuru Toga video. I'm so glad to find this page as I had thought myself freaky to care so much about pencils. This one, however, does not excite me too much as I already know how to keep the point of a pencil by rotating it; I do so automatically and probably save myself some strain. My favourite pencil at present (superseding the one with the cliker at the index finger position instead of the top where the eraser sits) is the Magic House number - it advances the lead automatically i.e. NO CLICKING, plus the lead is protected in such a way that it does not break with pressure - beat that! Personally my experiences with auto-feed mechanisms have not been all that satisfactory. I don't know theis Magic House pencil - is there a website showing it? Looks similar to a few others, but the auto-feed is what counts. Oh well, maybe one day I'll see one and get it. Never bought anything from Singapore before. While it is an exciting idea, it didn't really appeal much to me when I saw the ad for the first time. I was thinking; 'Hmm... Now this would surely appeal to my pals who keep twisting their pencils when they write'. Because I DO, in fact, prefer writing and drawing with a chisel edge. Most artists do, because a chisel edge presents 3 line widths; the thick stroke for covering areas, the calligraphy stroke, and the needle-width stroke. It really repelled me when I borrowed a schoolmate's pencil and had to deal with a rounded edge. I'd scribble furiously somewhere to get the chisel edge before I began writing. It's really subjective who this MP is going to appeal to. To those who turn their pencils, most definitely. But everyone, unlikely. There are alot of interesting things coming out of Japan, that's for sure. I saw an ad campaign that a friend of me sent to me... www.pentel.co.jp, the first little button on the red strip for those like me who can't read japanese, Ain Supplio... sented pencil lead that "stimulates those little grey cells"
There is even Shopkawaii.com, where you can see alot of the cute things japan is coming out with. Hi guys, Steve from Uni-Ball USA here. This pencil will be available in stores here in America sometime in June. Look forward to hearing what you guys think! I've had a Kuru Toga for about a week now ($7 at jstationery.com in the USA). Been using it as my workday doodling, note taking and idea-sketching pencil. It's definitely grown on me. The rotate-as-you-write feature certainly seems to work reliably as advertised. I suspect the value of this feature, as others have suggested, may be subjective. Personally, the majority of my pencil use is written words and code and for me, I think, this pencil offered some genuine (if small) benefit. On the other hand, years of preference for pencil rather than pen have made me a habitual pencil rotator and I found myself trying to resist that urge just for the purpose of testing out this one. I also don't rate it that high for drawing or sketching, for the obvious reason that a chisel point has its benefits for that. Regardless of its rotatory-lead widgetry, it's not an unpleasant pencil for everyday use. Seems to be quite sturdily built from various plastics. I'm a Pentel P205 type of guy, so this one seemed slightly fat to me, but not so much as I couldn't get used to it. The grip isn't unpleasant. It's a very slightly softer plastic than the rest of the barrel and is transparent so, presumably, to advertise the clever engineering inside. The grip is slightly ribbed, a bit like the older-style Rotring Tikky II. I'm not a big fan of that type of grip, I'd prefer some kind of scoring or knurling, but it's not excessive or a deal breaker. The fit of the cap over the (as usual, puny and worthless) eraser seemed a little lacking in grip and I can easily imagine losing the cap. All-in-all an interesting and potentially valuable pencil that I think I might keep using for a while as an everyday writer. Uni should be congratulated for trying something new and potentially with some genuine improvement, for some users at least. I'm interested to see how reliable the extra complication of the rotation mechanism might hold up over time. Steve from Uni-Ball USA . when will you be getting in some of the Boxym Hi uni Prouse, and Uni-Carbo series? these are badly needed in the US. Hi Germ, I just randomly checked this, we have no plans to launch those items in the near future, I think they are great too. I'll try to post if those plans change. thats a bummer Steve. Maybe plans should be made? :) hehehehe have a great day. Here in the U.S., JetPens and JStationery now have the "revolutionary" (:>))) Kuru Toga in stock in 0.3mm and 0.5mm lead width. If the clutch mechanism is engaged by the continual reapplication of the point to the writing surface, rotating the lead nine degrees each time, is a cursive writer more likely to wind up with a chisel tip than the writer who prints (the pure cursive writer would use one stroke per word--the printer would use four strokes to form capital 'E' alone)? Barrel - I would assume "YES" to your cursive writer theory, and "Sorry, afraid it is the norm" to the Sensematic mechanism. got one, and its quite a cool gadget but all your doing is getting rid of the need to rotate your original pencil. Hello, I write in cursive and I have always had a problem with my writing becoming really thick as I write across the line. Will this remedy my problem? If anyone could tell me I'd be set to buy one off ebay. Thanks. Cursive Handwriting - the answer is maybe. The point is rotated when you lift it off the paper. If you write long words without lifting it off the paper then it doesn't rotate and keep the point as sharp. All depends how you write, and how sharp is sharp, etc. In general I agree with Dave, the engine in the pencil doesn't work if you write very light or if you do not lift the pencil. the line should be of the same etc. Hope it makes sense anyway. Davs! Well, if you had a rectangular pencil lead, it would produce the line variations that are so desirable when writing italics/cursive. Like a Zebra MLP2. Hejsan, nice to see a neighbour here, I’m from Copenhagen, so we are not far from each other. Just one comment on the scripts: I usually try to keep "cursive" apart from "italic", as they are executed very differently. We don’t know what our friend here refers to as “cursive” – but I don’t think a script like Spencerian or Palmer method would benefit from a chisel edged tool like the Zebra – but for a slanted italic like Getty-Dubai it would be nice, some call this “cursive” too, confusing. The other forms rely on pressure for the desired line variation – and it is possible with an ordinary pencil, just not the Kuru Toga. "by its very design always writes like a mechanical pencil with lead worn down almost to the very sleeve opening because its owner has failed to advance it. In other words, scratchy, scratchy, scratchy." The Faber-Castell TKMatic-L had this same type of auto-advance. I agree with your description. It constantly felt like you were at that point where you need to push the button to advance the lead. I was given this pencil as a gift, it's the best mechanical pencil I've ever owned, and that would include quite a few. We carry these over at www.TokyoPenShop.com and they are currently in stock. 2. Hesitant for a few months before picking up this due to the cost and unknown feel of the pencil - no demo available at this store to try out. However, it has turned out to be an instant Winner for me!!! 3. The pencil lead is whatever Mitsubishi Uni provides - nothing 'amazing', but certainly not as smooth as Pentel's leads. Nevertheless, not a problem at all in use. The lead is definitely not their SHU brand leads - the SHU brand leads are definitely 'crisper' as I call it, a more crisp feel vs. Pentel's silky smooth lead feel. 4. Well-balanced and lightweight. Not at all like those all-metal graphing pencils from Pentel - much lighter in weight. Just short of feathery, but still has just enough weight to rest well in my hands. Good for twirling in your hand when bored, and even holding the pencil up towards the tip does not feel heavy - a good thing, some metal pencils are awkwardly balanced if you hold it too far towards the tip. The light weight will allow for hours of use without much fatigue. 5. Kuro Toga's spinning pencil engine does works better than I hoped for and is an excellent replacement for my own twirling. Honestly, it's one of those surprises that I simply love Japan technology for! Micro-printing with the pencil is just fine, and works great - a normal pencil simply fails at this once the end flattens out (assuming you never twirl the pencil yourself) with fat, fuzzy text. Nice, fine lines. Regular handwriting and printing works fine as well - never feel the need to twirl the pencil at all! Of course, the edge is never as super-thin as you can possibly get with a regular pencil if you write on the very edge of a sharpened lead, but you can't do this for very long since that edge will have worn down after a word or less. However, the thin, very legible print that you get with the pencil all the time is very nice and more than acceptable for print down to sub 3-4 point font size. Yep, that small! and you'll never have to twirl ever again! IMO, I do not feel any problems regarding writing on the thin edge of a pencil lead simply because it's not that at all - you're not writing on the thinnest edge of a sharpened pencil lead, rather, you're writing as if you were the world's expert pencil twirler. Thus, no dragging of the lead or breakage here at all - simply smooth, crisp, microprint writing if you choose all day long! A lot of fun at first is watching the little logo spin a tiny bit every time you lift the pencil, but that soon goes away (but that is neither bad nor good). The clear grip is mildly textured, three rings around the grip curved slightly inward, but nothing sharp edged that will irritate you. I would prefer the 100% smooth, circle barrel farther up the pencil instead to continue past the grip area myself. I don't like the latest grippy rubber grips of late, nor do I prefer a textured grip myself, so this is the best pencil I've found thus far that does not use a tapered barrel. Certainly wish Uni would come up with a version 2.0 pencil that has a perfectly smooth, cylindrical barrel. The needle point is of a perfect length - allows you to see the exact pencil lead tip under almost all writing angles and conditions w/o a fat barrel blocking your vision. Great for use with rulers as well as it's long enough to handle most steel, thick rulers. The simple plastic clip is plastic and works well w/o harming clothes. Not a very high grip clip, so don't expect to go bouncing upside down for very long with it however. The pencil eraser cap is twice as long as the exposed eraser, which is only 1/2 of the total length of the eraser. Makes one wonder? If Japanese pencil designers can come up with pencils that use up over 90% of each piece of pencil lead (dual chuck designs), why can't they come up with some eraser grip design that allows for the use of the 90% of the same??? Naturally, the little eraser portion that is exposed is a joke - begging the user to buy a Mono One or some other long/big eraser for use instead. Verion 2.0 of this pencil could integrate a 2-3cm+long twist eraser similar to other pencils on the market - this is far more useful and there's more than enough room for one at the end of this pencil. Color of the barrel is on the outer surface - painted/printed color, so expect chips and scratches with years of use. They could have gone with a clear barrel with color on the inner barrel, but figure Uni wants us to buy another Kuro Toga soon! Barrel is not so fat that it'll be awkward to hold for hours or in different positions, not too thin that it would cause cramps. 6. Overall, ROI exceeds the price of this pencil and the Kuro Toga easily jumps up to the top of my list as the best mechanical pencil I've ever used to write with (for writing). Yes, there are better pencils if you want a big, long eraser, but writing-wise, it's the best. 0.3mm? I'd say for most latin-based character writers, not necessary. You can write well below 4pt font size text all day with the 0.5mm version, with perfectly crisp, legible characters. 0.3mm would be a choice to consider if you were to write lots of Chinese or Japanese characters in small (newspaper text size) sizes, or require fitting lots of text in a very small space. Whoa! OK, well thanks Anonymous for this most detailed comment. If I had prizes available I'd give you one! Anyway, glad you liked the Kuru Toga. Wow, KINOKUNIYA sure are getting some great coverage - see 21 Jan in General comments. Anonymous, I did what you did and purchased a Kuru Toga - 2 in fact 0.3 0.5 and also purchased a Graph 600 0.3 limited edition. Kuru Togas ARE great pencils no doubt but on the logo that turns around as you write - if you try diagonal cross hatching say of twenty or thirty lines, that symbol will barely move although if you draw horizontal lines it does move consistently. By the way the Graph 600 is a far superior pencil in terms of balance, feel in the hand and sight lines down to the tip IMHO. Graph600 0.3 (is NOT a Limited Edition) - but is a great pencil!!! I bought the Kuru Toga and was super stoked to have a pencil come all the way from Japan to write calculus equations for me. I bought the 0.3mm version... in pink... since that is the only colour available on the website from which I purchased. I have to say that the Kuru Toga doesn't quite stack up against even a generic Pentel drafting pencil of the same lead diameter. The rotating mechanism makes the lead all squishy when you try to write with it, as the whole tip assembly sinks into the pencil body about half a millimetre. It's rather unpleasant; I buy small lead diameters only so I can write tinily. Having squishiness in my pencils is simply unacceptable. Also, the plastic wibbles for the sidegrip type plastic are of the wrong wavelength. It is uncomfortable on the tips of my fingers as I am writing, because I feel like I am constantly perched on all the crests of the wibbles. I do like the little pink squishama-ring near the tip though. It's a nice touch. Another beef I have is that the eraser is incredibly tiny! I feel like the year is 2050, and a global nuclear war has decimated the world population of erasers, and my only ration to last me the next year is a small eraser the size of a little rubber laptop foot. One last thing -- The lead rotation thing is completely worn off on this pencil. 0.3mm is simply too small to generate a perfect little cone of lead fast enough. 0.3mm wears out at a rate of a good four clicks a paragraph. If this model weren't supplied in a 0.3mm version, I would like it a lot better. But then, I wouldn't buy it to begin with... Anyway, that's all I have to say abotu the Kuru Toga. I was guessing that the PG2 is no longer made, but that old stock is still available. I also just found out that the PG2 is the only model in the PG family that has a sliding sleeve. I don't know if any 0.2mm fixed sleeves are available. I just got my 0.2mm out, and perhaps "insanely fine-lined" is an exaggeration. I good starp 3H or 4H woodcase pencil is almost certainly finer, and better supported (the 0.2mm breaks easily). The 0.2mm is pretty neat in the no-sharpening-required fine line quest. LOL i have this pencil and i didn't realize that it did this until i just read ur blog! It's cool that they'd come up with something like this but it is a little excessively unnecessary. Is it a good pencil? i might get one. It's out of stock everywhere! 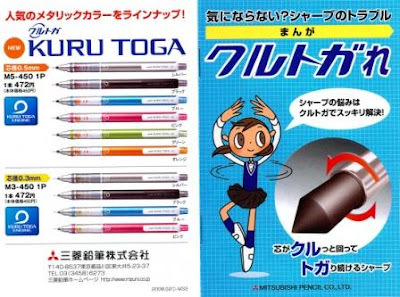 These are available in a number of places selling the Kuru Toga, ranging from "that auction site" and JStationery.com. I haven't bought one yet and will probably wait until I have other things to purchase... it's worth at least a try, given the relatively low cost. The report of the tip having some shock absorption does not bode well with me... I expect the tip to be very firm. Maybe it's just something to get used to. 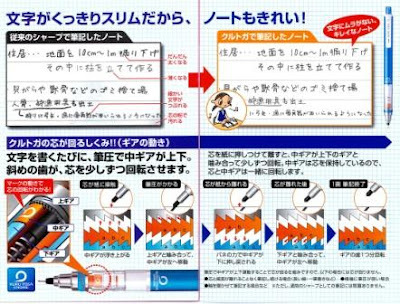 It is intriguing to see Japanese writing instrument companies continuing to innovate on a relatively "dead" product. The mechanical pencil design has remained pretty much unchanged for the last half century. The only real notable innovation I've seen in recent times is the double-clutch mechanism that Staedtler introduced, to utilize almost all of the lead (this was a peeve of mine, seeing all these little segments of lead get wasted with many MP designs). Otherwise, a dependable propelling mechanism and firm lead clutch is generally found in most MP's today. The remaining factors are probably size, grip, and color choices. Anyway, if there's anything I can suggest for Mitsubishi to try next with this design is a small side switch that lets you disengage and engage the rotation mechanism. I think this would satisfy most MP users. Amazing pencils. The .03mm pencil is the only one I have seen that I can use without breaking the lead. Just received the upgraded "high quality/high grade" 0.5mm kuru toga and it's definitely a winner. Basically the same MP engine with a nicer wave grip and a little more "heft". Cool looking pen Javier - http://jstationery.com/ much more tekky than the base model. These are great pencils. I think they work especially well when writing in Japanese / Chinese / Korean as the words are made with many more strokes, therefore the writer will lift the pencil from the paper more frequently than, say, writing in English. Totally love this pencil! I picked one up at a bookstore locally and thought it was nice, and the engine seemed to work reasonably well with the stock lead and with some B and HB leads I tried, but did not yield much difference with 4B...likely because the softer lead wears down to a chisel too quickly. This wouldn't be an issue if I liked using HB or B lead, but I haven't found any that are dark enough for me. 4B is very smooth and dark and satisfying, but unfortunately doesn't seem to benefit much from the KT engine. Further, even with writing Chinese, it can be nice to have tactile point control, and the KT kinda forces the user to "trust" the pencil is doing it. This for me has meant that with he 0.5mm Kuru Toga, I couldn't easily accomplish the same tiny characters that I could with a normal pencil with manual rotation. For even finer tasks, I preferred 0.3mm and 2B to KT0.5mm with HB. I can agree this is a very nice innovation overall (I wonder if the elimination of rotation affects RSI frequency), but for me personally, I can see myself reaching for other pencils more often (e.g. cheaper Uni Shalaku with larger eraser and retractable sleeve). I just got this pencil! And it was quite expensive! 48 HKD! I thought it was not worth it after I bought it, but then, I came accross this site and I just figured out this is wonderful!!!! Hi Janice, I also got it around for the same price the last time I was in HK. I'm glad you like the pencil. Where do you usually shop for pens there if I may ask. I just got this pencil via Amazon (different packaging, and no insert). So far, I love it. The tip stays sharp, and I like the grip. Would love to see this in a durable, heavier metal body. OK, this has been driving me crazy - where can I find "Japan and the Mechanical Pencil?" Google only linked me back here. Thanks! Jetpens in the US has them too and has for many months now. I wouldn't call it a drafting pencil. I have one. It's pretty cool, but it solves a "problem" that really isn't all that problematic. I just bagged 3 at Office Depot yesterday too! Love the pencil so far, far more consistent line. Hi 2nd_astronaut. Yes the high-grade Kuru Toga has been out for a while now. I've got a posting in preparation, but it will be a few weeks away yet. the lead sleeve is not retractable right? I've been finding Kuru Togas all over the place, but only in 0.5mm. The lead was a little scratchy, so I dropped in a Pentel B. I guess I'm not a huge fan. I think I would really like one in 0.3mm, though, but all I can find are 0.5s. I have a different model. It is completely metal. I love it :). I found this pencil in Kinokuniya in Singapore for about S$7.05. The Starter Set is the pencil itself plus two extra erasers and a blue-capped 10-pack of Uni 0.5 HB Nano Dia leads. The set wasn't in the regular Office Depot mechanical pencil section but in an aisle kiosk along with 50 or so other pen and marker products (but no other mechanical pencils). There was a yellow special-price label on its bin saying $3.50. I peeled back the special-price label to see the original price and it was $6.99 (I'm in Allentown, Pennsylvania, USA). I decided buy one and then, should I like the pencil, come back and maybe get one more. (There were five in the bin). I took my purchase to the check-out and the clerk rang it up -- for $1.75! I asked if there was some mistake and told him what the posted price on the kiosk was. He just shrugged and said, "Maybe you just got lucky." I tried out the pencil that night and decided to go back next day and buy their remaining four, if still there, and if still $1.75. Next day after work I walked up to the checkout with those remaining four pencils and, sure enough, the total came out to $7.00 plus tax. So I now have five of these very nice pencils, 50 (extra) leads, and 10 (extra) erasers, all for $8.75. Well thats one heck of a bargain. I really have this website to thank. If I hadn't stumbled upon your site about a week ago while searching for help with a problem I'm having with my Pilot Vanishing Point pencil, I would never have known what the heck a Kuru Toga was. That's the only reason the pencil caught my eye as I walked by it at Office Depot. The Sanford packaging is very nondescript and says almost nothing about the rotating-lead feature (as you can see if you look at my Amazon link in my post above). I not only knew all about the Kuru Toga when it finally happened to cross my path at Office Depot, but I recognized the Nano Dia leads included in the starter kit as being of a premium type. So I have you to thank, and I truly do appreciate it. The mechanism that turns the lead in the pencil is very responsive and so smooth I don't feel it working. The only way I know it's turning is by seeing the logo turning through the clear plastic. From that I know it's sufficiently responsive to turn each time you even lightly touch lead to paper. I really like the idea that, when you're writing cursive, the lead turns slightly with every word. And it's not only to keep a sharp point to the paper but to provide more lead as a support behind the tip to help prevent breakage. In other words, as I see it, you're writing with a point that's in the middle of the lead so that the point has plenty of lead behind it to support it, instead of the point being all the way at one side of the lead and having nothing behind it to support it. I can also say that the eraser is excellent. It seems the equal of the Staedtler Mars Plastic eraser I use in terms of cleanliness and completeness of the erasures it makes. This is my first full day of using the Kuru Toga at work since acquiring mine Wednesday. I have been using only my Pilot Vanishing Point instead of the Kuru Toga, just to make sure the various fixes lately attempted to curtail its lead-slippage-back-up-into-the-sleeve problem are indeed meeting with success over a few day period. In other words, I have been coddling that pencil, trying to bring it through its problem without resorting to shipping it to Pilot USA for service. The VP is one finicky pencil, but I love it. Finally though, this morning, things seemed to stablize, Pilot Vanishing Point-wise, allowing me to finally get around to switching over to the Kuru Toga. I filled out a form at work, first half with the Pilot VP and the other half with the Kuru Toga. The Kuru Toga half has a very noticeably neater look. My handwriting looks the exact same throughout that half of the document, while the Pilot VP half shows predictably mixed line widths in the words. The surprise, to me, is how much better a pencil-written document (a form, at least -- maybe not a document which depends on attractive handwriting which may benefit from varying line widths) appears overall as the line widths approach absolute uniformity. This attribute appeals to me, especially, because my handwriting needs all the help it can get, neatness-wise. I do rotate the Pilot Vanishing Point as I write. Every second or third word, perhaps, I turn it approximately a quarter-turn in my hand. I did do that on this morning's document and, still, there are some words with very considerably thicker lines than others. This is probably owing to my limited skill and attention at turning the pencil, but isn't that the point? As someone in one of the above Comments observed -- I believe it was "Anonymous" in his or her very long Jan 27 2009 Comment -- "you're writing as if you were the world's expert pencil twirler." Well said!, Anonymous. That expresses my thought exactly. TOKYO, Oct 16, 2009 (AsiaPulse via COMTEX) -- MSBPF | Quote | Chart | News | PowerRating -- Mitsubishi Pencil Co. (TSE:7976) is likely to report a group net profit of around 1.4 billion yen (US$15.5 million) for the fiscal year ending in December, some 600 million yen higher than projected, thanks to strong sales of new writing tools. Its total sales are projected to dip 13 per cent on the year to about 47 billion yen, roughly 4 billion yen short of an earlier estimate. Many companies have held off on buying writing instruments to cut costs, so domestic sales to offices are likely to be down 20 per cent. On the other hand, Mitsubishi Pencil has enjoyed strong domestic consumer sales of new products with enhanced functionality. The Kuru Toga mechanical pencil, introduced in March 2008, has been well received by students, already pushing the sales volume through the first nine months of this year above the total for all of 2008. The Jetstream ballpoint pen has also been selling well. Overall, sales to consumers are running slightly higher than last year's tally. In the example I mention in the Post above -- filling out a form -- I had to lay the pencil down often while retrieving information called for on the form. Sometimes I had to go on the computer to get the needed info, sometimes away from my desk. But in each case I had to lay the pencil down. Picking it up again, it was difficult -- no, impossible, reasonably speaking -- to know at what point I had left off turning the pencil previously. After all, my mind is on other things, in this case the confusing form I'm filling out that is asking for complicated information. I can't worry about which way to pick up the pencil. This would explain why, even though I diligently rotated the Pilot Vanishing Point pencil as I wrote, still there might (and did) result one word with thin lines directly next to a word with thick blurred lines. With the Kuru Toga, as long as I always hold the pencil the same, the point of the lead presented to the paper should always be the ideal, no matter how much time passed since last I picked it up, and no matter how many times I lay it down and pick it up and resume writing. I wouldn't even have to think about this inherent problematic aspect of writing with a pencil except to make sure I hold it the same way each time. Again, as "Anonymous" said above, "You're writing as if you were the world's expert pencil twirler." I love that. Another perennial pencil problem solved, it would seem to me. Yes, diligent manual rotating will duplicate to a certain extent what the Kuru Toga Engine does automatically, but the machine does it better, and solves this other problem -- of starting at the exact point you left off -- in the bargain. For that you absolutely need the machine. I'm curious now, since I bought 5 of these pencils, complete with 10 extra leads and 2 extra erasers each, for $8.50 -- so the mechanism must not be expensive or difficult to manufacture -- how soon will it be until pencils in general all have it. It truly is a big improvement, as far as I can see. Picked up one of these on lunch break at Office Max I was suprised they had this. The thing is it's put out by Sandford of American yet it's made in Japan. It has a different type of packaging the US version that is rather cool looking.. This is truly an excellent product! Last week, I just picked up a starter set for the Kuru Toga at my local Office Depot chain store branch for only $2.00 + tax! And, the set also includes a couple of extra spare erasers and a tube of ten (10) Uni diamond-infused leads! Hi Anonymous, If you live anywhere near Sydney they (the original plastic version, not the high tech version) are available at Kinokuniya in Sydney CBD. I regularly buy from Jet pens and their shipping is high. I usually buy 4 or 5 pens or other stationery to defray the shipping cost on a per unit basis. I also purchased the glossy black model at Office Max. I like it and I prefer this color scheme to the blue and white color scheme. I feel that the biggest improvement to be made in this pencil is some sort of lead viewing window. The aperature where leads are inserted is very narrow. You have no way of estimating the number of leads stored in the barrel and the narrow aperature doesn't allow leads to fall out. This feature is good for preventing leads from accidentally escaping, but hinders the estimation process. And, of course, a bigger eraser would be nice. On the other hand, it performs quite well and the rotation mechanism works. well i was on jetpens and i saw the newest kuru toga incarnation, it is a kuru toga and an alpha gel put together!!! now im debating wether or not to get it.. I have the gun metal OLEeNU pencil. Absolutely loved it for the first few weeks, but now the rubber hand-hold near the tip is loose and slides when writing. I guess I need some stickum for the rubber. Today my gun metal OLEeNU pencil arrived (packaged like a christmas present :-) ). That inspired me to check online. Office Depot's website has it for $7.29; OfficeMax's website has it for $7, the same as Art Supply Warehouse's website. I bought mine at Art Supply Warehouse's store in Westminster, CA. Unlike Office Depot, they charge $7 in person as well as online. I can confirm that the photo shown on the OfficeMax page is what the US package looks like: Very non-descript, as Karl Myer said above. In fact, the US package doesn't have the “Kuru Toga” name anywhere on it, except in the photo of the pencil (on the back). The package merely calls it a “uni-ball mechanical pencil”. Incidentally, I notice that all three of those sellers of the US package, plus Newell Rubbermaid's own office-products page (Sanford, Uni's US distributor, being a Newell Rubbermaid company), list the “Kurutoga”/“KuruToga” as one word. On the pencil itself, it's two words. Bought one today at Office Depot, for about $9-$10, along with a Pentel Kerry. Did not know about Kura-Toga rotation. Started writing and found the tip had a great deal of play. I thought oh-no, should have tried to hunt down a Koh-I-Noor instead. Surprised to read here about people rotating their pencils; I thought it was just me that rotated. :-) It will take a few months before I decide if I like it. If not it will still be an OK pencil. I came across a Japanese blog where the blogger modify his Kuro Toga to hold 0.7mm lead. Scroll down the page and you'll see pictures of how he did it. Note the simple instructions in English just below the pics. I have all the flavors of the Kura. 0.3, 0.5 and the Metal one from Japan. Love them. Not as heavy or as attractive as I would like; I am a major pen and pencil collector. Love the technology. But, I use the Pentel Kerry and the GraphGear 1000 more often due to the asthetics. Well I have finally completed my 0.7 kuru toga. Thanks for posting the links to your friend in Japan, Dave. I can't believe I'm writing with 0.7. It's almost not noticable from the 0.5, but the lead is lasting so much longer. I did an entire page worth of calculations without advancing the lead, and I only had it out about 1mm. Really the only finer line is my 0.3 kuru, but just having a 0.7 kuru is so worth it. One of these days I'll do a write up on how I did it (similar process, just different materials). Eric - very interesting - thanks for your comment - look forward to the process write up. I notice you can get these in Sainsburys in the UK. Hi - i love these pencils too and have purchased mine from Tokyo Pen Shop (www.tokyopenshop.com) for only $6.50. Definitely a bargain from the $10 price tag at Kinokuniya (Cupertino). Hi from Spain. After reading all your reviews, today, I've finally received my KuruToga 0.5 (plastic). I must to say to all of those claming for not so good construction or working of mechanical engine (too low pressure, easy to break, ...) that from my point of view, are wrong. Compared to other pencils in the same range, this looks very cool and comfortably on hand, good design and grip, construction in general. It is true that it could has a bigger eraser but... which pencil has? Ok, there are betters pencils (I have Namiki Vanishing Point, Faber Castell, Rotring, etc) but this is the only one sharpening itself. And it works great!! i love kuro toga i have one. at first i thought it wasn't nice. now i like it!! I have one of these. Have you found a place that sells replacement erasers? The pencil is virtually unusable after the eraser is used up. I need an eraser! I have been using mine for a week, and it has been a mixed blessing. I have always held my pencils at a shallow angle, and it was not until I re-trained myself to hold it more vertically that the mechanism started working. But once I got it working... oh boy, does this thing write well. In the "making marks on a paper" category, it is unrivaled. But... the eraser is awful. Tiny, and it sinks into the pencil whenever you use it. On Thursday I finally gave up using it and bought a standalone eraser. The hassle of that is enough to drive me back to my old Pentel Twist-Erase, which I have used for years. I am in that camp of people who consider the eraser as important as the writing end, and the Kuru Toga falls on it's face when you try to erase anything with it. I used one of these for a while, and I really enjoyed the design, although I would have preferred a retractable tip and an extending eraser. Also, if you write or draw lightly, the mechanism won't activate. If sketching light guidelines, it won't rotate at all. Just something to be aware of. I got mine in 0.3 lead size from Japan, and it's fantastic! My class notes have never looked so beautiful. I also have it in 0.5 size, but I much prefer 0.3--every single stroke is thin and perfect! But that's a matter of personal preference. The 0.5 size is available in the United States on amazon.com; not sure about other countries. I like the idea and it was fun to use. But overall it is not a pencil for me. (1) The plastic is slippery. It slips in my hand, and also the assembly loosens. I tried fine sandpaper but it did not help much. (2) I realized I unconsciously rotate pencils while writing, so I fight with it a bit. (3) The outer plastic sleeve broke at the area where you look through to the mechanism. (4) The movement of the lead is too great for me. I usually use a fixed sleeve pencil. I've had 3 of these (which I won in a UniBall contest). I loved them at first, but after a short period of use, I can't recommend them. That's because they fall apart in your hands. The cap the covers everything but the lead on the writing end comes loose very quickly. The first one lasted only about a week and I don't even know where the cap disappeared to, but without the cap, the rest of the mechanism starts to disassemble. The second one lasted about 3 weeks before it, too, disintegrated. That, and the woefully inadequate and tiny eraser (and its cap, which tends to fall off and disappear as well) make it a fairly useless product in its current incarnation. If they can fix those problems, they'll have a good product. I was at a local Office Depot store over this past weekend and noticed that the reverse side of the blister card of the Kuru Toga starter set now states "made in China".....hopefully the quality has not lessened as a result since these previously originated from Japan. My Uni Kuru Toga arrived a few days ago. I’ve been trying it for the past 2 or 3 days and so far I can’t say that I’ve enjoyed it. My handwriting for some reason got worst using this. Sometimes the rolling mechanism didn’t work as well. Also, there’s some sort of ‘play’ on the lead, it doesn’t feel solid, like it’s wobbling a bit everytime you write. My conclusion: It’s not as good as the hype. I found one at Office Max (Mountain View, CA, USA) for $6.29. The front of the blister pack did not mention a starter kit though it did come with two tiny erasers and some Nano Dia lead. Only on the back of the package was there any mention that the lead rotated. This one was made in Japan. The packaging appears to be for the US and Canada markets since all of the printing on the package in both English and French. It is a nice looking pencil but is a little thicker than I usually like. I'll try it for a while after my current experiment with a Pentel 225. I bought a couple of these from Amazon after they went down to $4 (where they're still at: $3.88 as I write this). They are indeed made in China now, which may explain how they cut the price in half. I suspect that any “made in Japan” KTs still available, at least in the US, are old stock. I haven't tried out the new ones yet, but I can already see that they've changed the color scheme a bit. Not so obviously different as the Japanese-package models, but the barrel is now a single translucent black piece (previously solid black until below the “Kuru Toga Engine” logo), and the ring and cap are now blue (previously gray and translucent-black, respectively). my friend also send this to me from japan. It actually does work and in the 3 months that I've used it, it only broke the lead 3 times. Thats amazing. I bought one of these, but do not recommend it. It is good for novelty value, but fails miserably as an actual writing implement due to the play in the tip, which greatly reduces precision (much more than non-rotating lead would). It does have a solid feeling click mechanism, pushes lead out just the right amount, and the rotating mechanism operates as advertised. Unfortunately the play in the tip nullifies all these good qualities. I'm planning to see if I can design a small shim that will reduce the play while still allowing the rotating mechanism to work - if I can do that, I'll be happy. Just wanted to update from the previous comment that I managed to remove the lateral play from the tip of this pencil. I added a small metal washer that slides over the black plastic 'inner' tip, after unscrewing the chrome tip cover. The washer's purpose is to hit the inside of the outer tip when the black inner tip tries to move laterally, but still allow axial (up/down) movement so the engine can work. I filed/sanded the black inner barrel a little (not visible externally) to get a perfect fit - it takes some fine tuning to remove the play but still allow some movement so the engine can work when the outer tip is screwed on and tightened. Might be useful for the home tinkerers out there - now I have a pencil that is both novel and useable. Many thanks to Kiwi-D for this cornucopia of pencil knowledge. I taught junior high kids in Yawata Japan (2007-2010), and one of them wrote an English report on how wonderful this Uni Kuru Toga is. I bought one (my only pencil) which was stolen out of my desk while teaching 9th-grade Earth Science here in California (Spring 2013). I never fully understood all the hullabaloo about this pencil until reading here. I also found the Pentel Sharp Kerry described here in the most exhaustive detail to be more appropriate for me. Just ordered one. Thanks again for turning pencil knowledge into a shared academic pursuit and making the loss of my Kuru Toga into a big Pentel Kerry gain. I just bought one of these pencils for five dollars at Walmart Supercenter. Im just putting this out there for prospective buyers who don't want to pay seven dollars or more for a pencil. The new 0.7 mm Kuru Toga includes a lead viewing window. This is a great improvement. Unfortunately, the trim color is neon green, not my favorite. I didn't purchase one of the new 0.5 mm models, so I don't know if that model includes the window. I am referring to the black plastic models available in office box stores and similar. I have a few of the 0.5 mm models that Bob S. mentions (the newer “made in China” model with a blue eraser cap) and can confirm that it has a lead viewing window. I never noticed it before, since most of the lead chamber is solid black, but if you hold the pencil up to the light, there is a ~1-cm-long transparent section right about in the middle (hidden by the smoke-gray exterior) where you can see the lead rattling around. Good evening. Have you seen, tried, or have a view on the Kuru Toga premium that seems to be popping up a little now. Love the original, but was always a little light for me. Hoping this might have a little meat to it :) Looks smart! A "starter set" for this pencil with 10 diamond leads, two extra erasers, and the pencil itself in a blue color scheme is on sale at Office Despot in the US for 2 USD! Office Max will price match. I can't think of a reason not to pick this up at that price! As to the pencil itself: It feels really good writing with it. Its low weight, but feels very precise. My only complaint is that the lead sleeve wobbles significantly when you erase. But, let's be honest, few of us will do much erasing with this tiny little cap eraser. I purchased a gunmetal coloured one of these from Amazon. The auto-rotate mechanism worked for a day then stopped. I could still see the inner body going around incrementally, but the lead wasn't turning as it flattened out like with a normal pencil. I am sad because I really wanted this to work. Has anyone had prolonged use from it? I want to know if I should replace it or get a refund. Hey Guys high school student from Canada, and guess what? Walmart stocks these. Tada get really hyped, Dont know if you Americans and Brits have em at Walmart, and i think you can order them online at the Uni Ball site. I use mine for my puzzle books, always the same line. Basically the world's best pencil. Uniball is selling the Kuru Toga online in India. I bought a couple myself and have been using them to my entire satisfaction. My only complaint is not against the Kuru Toga but against 0.5 mm leads, which tend to break off rather easily. A larger lead size such as 1.1 mm does not break off easily but tends to become too blunt for marginal notes rather quickly. The Kuru Toga turning mechanism would be of much greater use with a thicker lead. However, thicker leads have been steadily on their way out for the past four decades so I do not think we will see a Kuru Toga mechanism for 0.9 mm or 1.1 mm.